In many cases, Texas was never too far from the equation. "What you’ve done to build the party in this state is amazing, and you didn’t get no help from Washington," Labor Secretary Tom Perez told the crowd gathered at the Sheraton Hotel downtown, delivering the most Lone Star State-specific speech of the afternoon. "Imagine what we can do with a DNC chair who has a big table who understands that we all succeed only when we all succeed." It was the first joint appearance by the entire field of candidates, who are vying to permanently replace Debbie Wasserman Schultz, a congresswoman from Florida who exited her post in July. Perez made his run official Thursday, while Sally Boynton Brown, executive director of the Idaho party, did a day later. Addressing the State Democratic Executive Committee, the candidates emphasized the need for a national party that is less focused on Washington and pays more attention to state organizations. It is an especially pertinent message for Democrats in traditionally Republican Texas, who have watched for years as their money and manpower have been exported to more competitive states. “The day when you can come into Texas and raise money and take it all out of Texas must end," said U.S. Rep. Keith Ellison of Minnesota. "Texas can no longer be an ATM machine for the Democratic Party," Perez declared. State parties also factored prominently into the pitches by Jaime Harrison, who chairs the South Carolina party, and Boynton Brown, who warned state organizations could become "obsolete" in two decades if the DNC does not adequately tend to them. Harrison had some tough talk for his own party, saying Democrats "got drunk off of" Barack Obama's wins in 2008 and 2012 and began neglecting state infrastructure. Of the five candidates, Ellison appeared to get the most enthusiastic reception, though Perez was not far behind. He drew knowing laughter from the room as he called Texas, whose GOP leaders are constantly battling the federal government, a "full-employment act" for the Justice Department's civil rights division, where he once worked. The state's Democrats are looking to re-assert themselves at the national level after encouraging results in the presidential race in Texas. Trump won by only 9 points, the narrowest margin of victory for a GOP nominee in the state since 1996. On Saturday, there was little direct reflection on the broader 2016 presidential race, which saw Wasserman Schultz resign after an email leak that revealed the DNC had been less than neutral in the nominating process. Raymond Buckley, who chairs the New Hampshire party, proved to be the exception as he used his remarks to bring up the "elephant in the room." "We’ve got to look at what we did in this nominating process because if we do not address and fix it, we have lost millions of voters. They either voted for Jill Stein or wrote in Bernie Sanders or simply didn’t vote," Buckley said, going on to tout how he has been "100 percent neutral and 100 percent fair" as Granite State chairman. Of the five candidates, Ellison had been arguably the most active in the primary, emerging as an outspoken surrogate for Sanders — who has in turn endorsed Ellison for the DNC job. But noting he went on to campaign for Clinton once she was the nominee, Ellison called himself a "unity candidate who will bring all our factions together." Ellison also reiterated his pledge to give up his seat Congress if elected to lead the DNC, a key consideration for some Democrats displeased with how Wasserman Schultz balanced the two roles. "I'm willing to leave it because it's just that important," Ellison said. 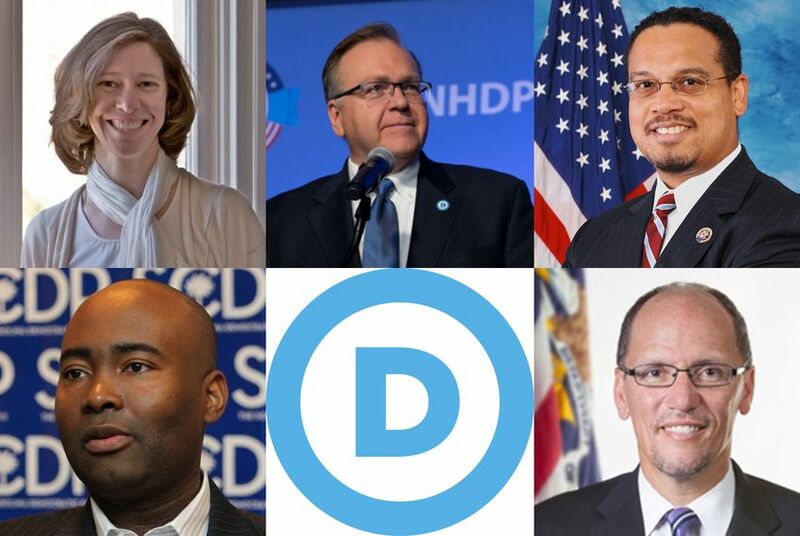 The DNC will elect a new chairman at its next meeting, which is scheduled for Feb. 23-26 in Atlanta. Texans will get at least one more chance to hear from the candidates before then, with the DNC planning a regional forum for Jan. 27-28 in Houston.